We are working in partnership with others to start a New Narrative – a conversation with Canadians about our sector – who we are, what we do and how we are making a difference. While our organizations are trusted and generously supported, we know we can do a better job explaining our role and contributions. Work or volunteer for a charity or nonprofit? Our Issue Sheets will help you explain to others why it’s important that we, as charities or nonprofits, have a strong voice in public policy and why an organization’s ‘overhead’ is not always the best measure of its success. 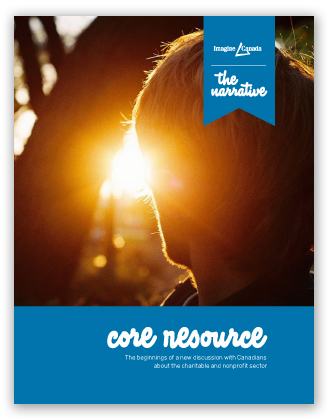 For more details, including a comprehensive look at the sector’s size, breadth and impact, read the Core Resource. Share and use any of this information if it is helpful in your own work. We’ll be updating and adding elements to the Narrative Tool Kit all the time so plan to come back and visit often. This is the foundation for the Narrative. It contains information about our sector’s impact, research highlights, overview of pertinent issues and impact case studies from organizations. You’ll find additional resources on our Sector Source website and through our Sector Monitor research program.? Learn more about Canada’s charities and nonprofits — it would be impossible to imagine Canada without them! A special thanks to members of our Narrative Steering Committee whose support for this work has been invaluable. We wish to acknowledge financial support from the Ontario Trillium Foundation, an agency of the Government of Ontario, The J.W. McConnell Family Foundation and the Agora Foundation. Note: While the Narrative is about both charities and nonprofits, the emphasis in our examples and commentary, given the information available to us, is about registered charities.